No one would have described the Elantra GT as elegant until now. Two years ago Hyundai brought a refreshed Elantra GT to the Chicago Auto Show. That car was OK insofar as it didn’t look awful, was nicely equipped and priced accordingly. At this year’s Chicago Auto Show the South Korean automaker revealed a brand new Elantra GT, and unlike the hatchback that debuted two years ago this one is much better than OK. Hyundai has completely revamped its almost-hot hatch. Weight is down, torsional rigidity and power are up and best of all is the fact that this no longer looks like an economy car. 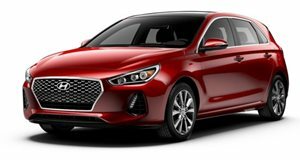 In its press release Hyundai talked a lot about the Elantra GT’s “European styling.” We’re not usually big fans of marketing mumbo jumbo but will admit that this description is accurate. The new Elantra hatch is much more Audi A1 after spending years looking like the Korean equivalent of the Toyota Yaris four-door hatch. The new model is lower, wider and longer than the outgoing one. Torsional rigidity is up 22% thanks to the increased use of high-strength steel and weight is down 61 pounds. The Sport trim, which is the car shown here, is especially fetching. Hopefully the base model isn’t a total dud in the looks department. Under the hood the Elantra GT gets two engine options. The first is a naturally aspirated 2.0-liter four-cylinder making 162 horsepower and mated to either a six-speed manual or an automatic transmission. The Sport trim is where things get “hot.” The Elantra Sport’s engine is dropped into the Elantra GT. The 1.6-liter turbo makes 201 horsepower and 195 lb-ft of torque. The two transmission options are a six-speed manual or a seven-speed dual-clutch. The Sport trim also gets a multi-link rear suspension setup, 18-inch alloy wheels and large brake rotors front and rear. On the inside all Elantra GTs come with 96.5 cubic feet of passenger space and 25 cubic feet of cargo storage with the rear seats folded up. All models get a standard 8-inch display screen equipped with the newest version of Hyundai’s infotainment system. The overall design of the cabin is much slicker than the previous Elantra GT. Hyundai appears to have taken a page or two from the Mazda playbook and we aren’t mad at all. Pricing was not announced at the show, although a bump up over the current Elantra GT’s MSRP of $18,800 should be expected. The Kia Forte5 SX, the Sport trim’s kissing cousin, is priced at $20,990. Expect Hyundai to shoot just a bit over that.